The Zew experts are decidedly less upbeat than they were. 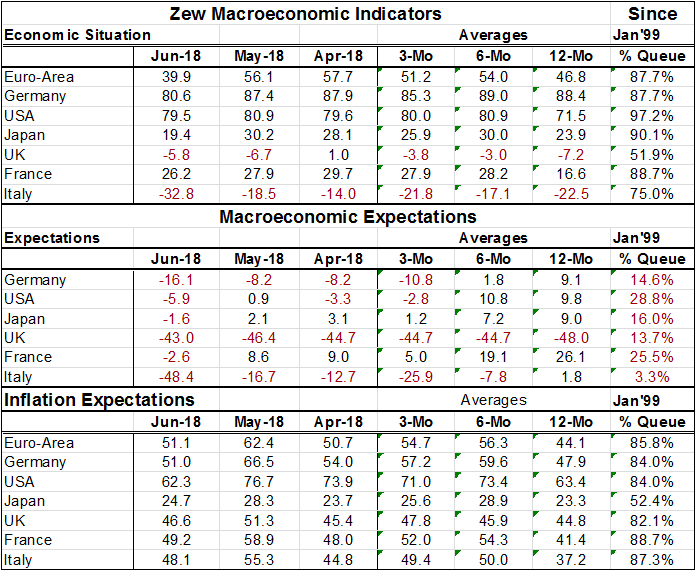 The Zew financial experts assessments still have roughly the same sorts of rankings that had prevailed earlier with strong rankings on current assessments and more pessimism on outlook rankings with still-elevated inflation readings. But in June especially these ranks have changed, eroding for current assessments and expectations while inflation expectations have softened. The world according to Zew has shifted and may still be shifting. The Zew assessment of current conditions has taken a huge step back for some countries or areas but not for all. The Euro-Area that has had raw diffusion readings for its macroeconomic situation in the 56 to 57 reading area since January has now dived to show a macroeconomic assessment of 39.9; its weakest since October. But despite this outsized step back, the queue standing for the Area remains high in its 87.7th percentile. Germany, where the monthly macro-assessments have been at 86 or higher since June of last year, has slipped to a reading of 80.6 in June. It has slipped to its weakest reading since April of last year. And some of the weakest German economic readings for orders and industrial output have only been released in the past several days so Zew experts may still have some trimming to do on the German assessment. France's assessment has been reduced by very little this month but it has been slipping for several months. The French assessment has morphed from a reading that was negative in in September of last year to a peak in February of this year and has undergone slippage ever since. Still, France has a queue standing in its 88th percentile at a much lower diffusion value than EMU and Germany but with about the same queue percentile standing. Italy has been sharply downgraded in the wake of its elections to a -32.8 diffusion reading down from -18.5 one month ago. Italy has negative readings since March and has been slipping since January. The macroeconomic assessment for the US is nearly unchanged on the month, lower by 1.4 points in June compared to May and back within one tick of its April reading. The US maintains a 97 percentile queue standing for its macroeconomic assessment. All this seems to green-light the Fed for its agenda of rate increases but what that will do to exchange rates globally is another matter. Japan's macroeconomic assessment was knocked back to 19.4 from a 30.2 assessment, Japan's assessment had been in the high twenties to thirties since November of last year but it is down in June and was last lower in October of 2017. The UK is the only country in the table with an improved macroeconomic reading on the month, although its raw reading is still negative. The UK has a long string of mostly negative readings stemming from its adoption of Brexit. It has had its weakest reading around October of last year but May did bring the UK reading lower and in June the UK, against the global trend, recouped only a small portion of the May drop. On balance it's hard to call the UK much of an exception and it continues to have the one of the weakest queue standing in the table for expected macroeconomic conditions (only Italy is worse off). The current assessment took large reductions generally but every generalization has its exceptions. The macroeconomic expectations are worse across the board and on average worsened more that did the current assessments. But the expectations have worsened the most for Italy with a 31 point one month drop and then for France with an 11 point one month drop. Italy now has the lowest queue standing (worse historically only 3.3% of the time) followed by the UK with a 13.7 percentile standing, Germany with a 14.6 percentile standing and Japan with a 16 percentile standing. Macroeconomic expectations in the US and France have the strongest queue standing with the US at a 28 percentile reading and France at its 25th percentile. None of these is impressive. In line with stepped back current conditions and a weaker macroeconomic outlook the outlook for inflation has pulled back in all survey areas. Germany and the US have seen inflation expectations lowered by the most by 15.5 diffusion points in Germany and by 14.4 points in the US. But inflation expectations are still strong with a an 85.8 percentile standing for EMU and an 84 percentile standing in the US and in Germany- France and Italy have even higher inflation expectations standings in their respective 88.7th and 87.3 percentile standings. On this view you can see what I mean by my opening remarks. While there have been some dramatic changes in terms of diffusion points shed and assessments for Italy have worsened dramatically (but, interestingly, not for inflation) the rankings show more or less the same conditions as those that had prevailed before. Current conditions are still strong, inflation expectations are still high and macroeconomic expectations are weak. The Zew assessment summary table puts all the queue assessment rankings together for the forecasted variables by country and region. At the table bottom unweighted averages show some key summary statistics. Note that the largest (absolute value) change is for stock market expectations and that Zew experts are looking for a decisive pull back in stocks compared to last month's profile. Short term rates are seen mixed (little changed) while long terms rate levels are seen lower possibly a reaction to the lowered expected inflation outlook.